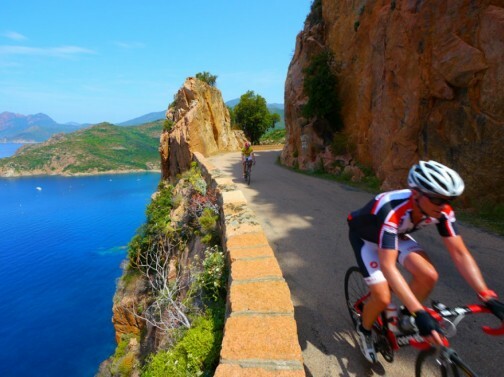 It doesn’t take long to understand the allure of Corsica as a prime destination for cyclists looking for an unforgettable international cycling holiday. The rocky mountainous landscape and winding road network makes for a perfect concoction of both challenging and relaxing days in the saddle. 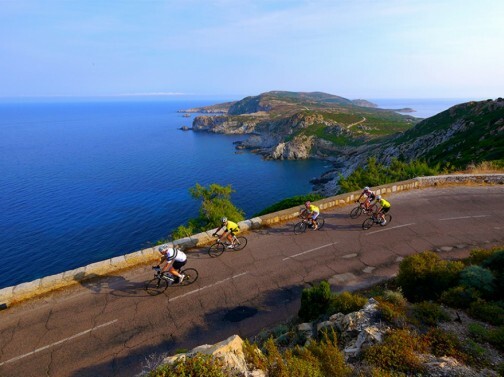 Our Corsican cycling trip will have any keen cyclist salivating on the thought of taking to the road on this stunning Mediterranean island. First impressions count and you won’t be disappointed as your first day on the road has you rounding the northern tip of Corsica, Cap Corse. The scenery is a blend of rugged yet spectacular coastline, 16th century Genoese Towers and quaint fishing villages. As you make your way down the west coast, Corsica’s attractions are in abundance and everywhere you look. Visit the trendy seaside beach villages of St Florent and Algajola. See the unique pink cliffs of Porto and take in this seaside towns’ resort buzz. Brace yourself for the climb as you exit Porto whilst being more than compensated as you cycle through the UNESCO world heritage listed rock formations of Les Calanques. A fitting end to your trip as you stay in the Corsican capital Ajaccio, famed for being the birthplace of Napoleon Bonaparte. Our cycling trips are designed for the participants to be just more than just ‘fit and healthy’. In our view, rides that require both a physical and mental challenge is a key ingredient to a deeply rewarding cycling experience. We’ve chosen routes that will require you dig a little deeper in certain stages on the ascents whilst providing richly rewarding descents. Alternative cycling routes are also available on most days, so you can dial up or dial down each days physical demands dependent on your skill level or preference. Your support vehicle is also readily available should you need a lift. Expect rolling terrain with some hard climbs and averaging around 70-100 km per day. The elevation gains generally equate to approximately 700m+ per day. This Corsican cycling experience has been designed for fit beginners, strong intermediate riders and above. There is capacity to extend routes on most days to cater for stronger riders. Before setting out on each days ride you will be provided with an opportunity to review the planned route with the freedom to choose an alternative journey should you wish. You will also receive comprehensive route information highlighting route along with maps (e.g. Michelin) and GPS tracks that can be downloaded into your personal computer. Your journey will start the minute you touch down in Bastia where you will be warmly greeted by your guide and taken to your hotel to commence preparations for your trip. Enjoy a welcome dinner by the sea in the evening. We’ll transfer you to Ajaccio’ airport this morning for your flight home or onward journey.